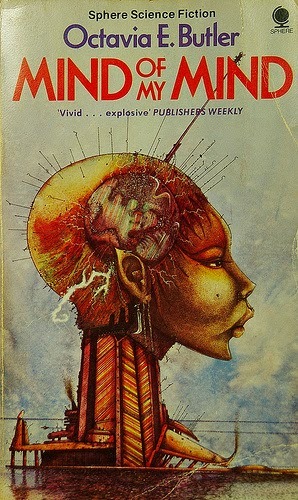 Mary from Octavia Butler’s Mind of My Mind is an example of an uncanny black woman character, and my favorite character from the Patternist series. She is sassy, sharp, beautiful, and ambitious. Not to mention she has the ability and resolve to defeat Doro, the troubling leader/creator of the group of beings with special powers. As an “experimental model,” Mary was often underestimated. Her “traffic light green eyes” and brown skin were results of her predecessors. The youngest of the Patternist women, Mary is undoubtedly the strongest and most uncanny. As the Queen B of a mental pattern of telepaths, Mary has the ability to create the superhuman beings that Doro, the series antagonist, hoped to develop. She can also repurpose the latents—those unsuccessful experiments—and usher them into transition so that they can develop their powers. Mary is the completed version of Doro, his female twin and with the Pattern she is his superior. In a battle between Mary and Doro, Butler writes, Doro “Strained against the seemingly fragile thread… [Mary] consumed him slowly, drinking in his terror and his life, drawing out her own pleasure, and laughing through his soundless screams.” She defeats the spirit man, her father, her creator, and assumes his position as god.